Hospitalization episodes of the renal population require careful documentation, as they represent a significant expense and an important deviation from patients’ routine treatment. It is also important, through careful charting, to maintain continuity from one mode of treatment to another. 1) registration of patient status and treatment upon admission, during the hospital stay and upon discharge, including the preparation or registration of transfer documents such as a Discharge Report. 2) maintaining statistics regarding hospitalization rates, hospital diagnoses etc., for use in treatment evaluation and planning functions. Some facilities may elect to use only a general subset of these functions (admission and discharge dates, location and discharge diagnosis) as required. cyberREN’s hospitalization charting facility is well integrated with other components of the cyberREN system, in particular the Problem List, Care Maps, Physical Exams, Event List, Medications, Billing, Ordering, Dialysis Orders and Appointments functions. 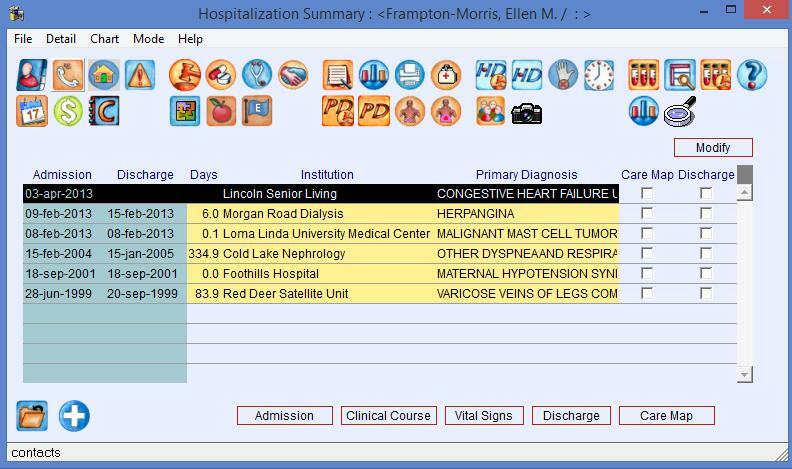 The hospitalization record offers significant charting detail, including the ability to import or scan in a comprehensive Discharge Summary issued by the admitting facility.